This is a presentation outline. 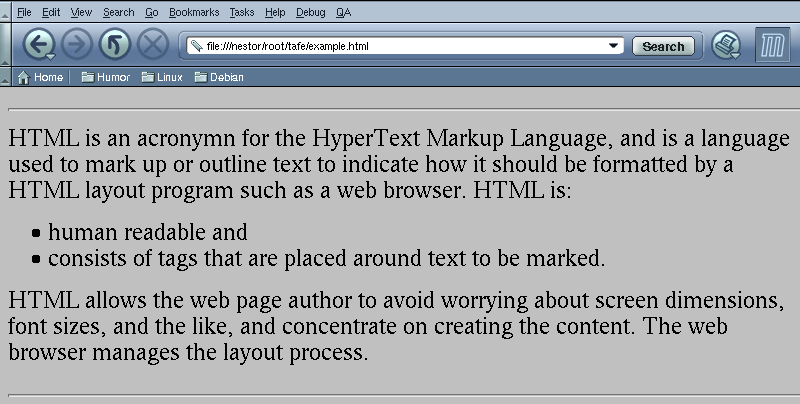 It was converted from the MagicPoint presentation program to the LYX document processor, and then exported as HTML. Client does all the work! Hand over can be transparent! Who is the page designed for? can be achieved using tables anyway! by a HTML layout program such as a web browser. browser manages the layout process. can you figure out where to go next? is it clear how to go back? is it clear how to go forward? is the information presented in a structured way? is the information in a readable font? are the text colours contrasting against the background? is the page legible without images enabled? does it download within the critical 15 seconds? is your target market on rural modems? do the colours mix well? do the colours or patterns clash? do the colours suite the content? is whole site using a common theme? are the graphics a suitable size compared to text? are they using a restricted colour map? ``Oh, I must have a video on my page!'' - why? can a disabled person access the page? is there enough information in a frame set page for the blind? is information hidden in images or icons? does it still look okay? Demonstrate the use of a web page editor by creating two web pages that incorporate simple elements including a still picture or graphic, text, colour, and tables. The first page must include a link to the second page. Submit it on a floppy disk next class. Call me if you have trouble! Each point was worth 10%. Following the marking of all thirteen project submissions on 17th November after the class, most students were awarded 100% score, 2 were awarded 90%, and one 80%. Two students failed to use a table anywhere in the pages, and one student had no working offsite links. This ended up moving to the second class. Forgot to mention this in the class. See (I think) http://www.png.org/ or do a web search for PNG. PNG means Portable Network Graphic. Author used the word arena in original presentation.